Husband, brother and mentor to many, Stanley L. Martin, a well-established business man of Lansing, MI, passed away peacefully on Wednesday, February 6, 2019, at the age of 78, with his family present. He had bravely confronted and succumbed to his short-term cancer diagnosis. He was born March 26, 1940, in Lansing, MI, and resided in Dimondale, MI for the past 52 years. He graduated from Sexton High School and Lansing Community College. He is survived by: his wife of 44 years, Arija Maija (Kepitis); siblings, Arlene, Mary Ann, Alan (Glenna), Paul (Priscilla), and Kenneth (Paula); and many nieces and nephews. Stan was predeceased in death by his father, Gregory J. Martin; mother, Pauline (Theis) Martin; and brother, Gerald Martin. From a young age, Stan began working in the family business of Quality Dairy Co., founded by his father, Gregory J. Martin and Harvey Mack in 1936. The ownership changed in following years, bringing Stan and his brothers as partners in the company. 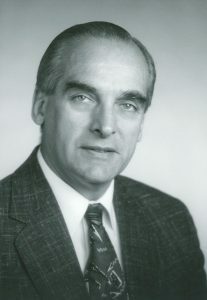 As Stan worked his way from entry level positions in the company, he moved to the position of General Manager, President & CEO of Quality Dairy in 1984. During his years of service, he accepted the reign of leadership from his father taking the responsibility seriously. He worked to learn the art of business and the understanding that knowledge and continuous learning were essential for success. Along with the family business, Stan was committed to supporting others. He felt that knowledge was key and helped to mentor those under his leadership. He served on many boards including the Board of Directors for the National Association of Convenience Stores (NACS), the Sparrow Hospital Board, and on various CEO groups. When not working, sailing was his passion. He and Maija enjoyed many hours with family and friends on open water. He and his wife enjoyed traveling to various destinations in and out of the country. He also enjoyed his long nature walks. Visitation will be at Estes-Leadley Greater Lansing Chapel, from 2:00 p.m. to 6:00 p.m. on Sunday, February 10, 2019. Funeral services will be held at 11:00 a.m. on Monday, February 11, 2019, at Estes-Leadley Greater Lansing Chapel, 325 W. Washtenaw St., Lansing, MI. Interment will follow at St. Joseph Catholic Cemetery. A luncheon will follow at the Royal Scot Banquet Hall. Flowers may be sent to Estes-Leadley or those who wish to donate may do so to Michigan Dyslexia Institute of Lansing or Community Mental Health Authority of Clinton, Eaton & Ingham Counties. A mentor and leader. You will be missed. Cousin Stan, we will miss your friendly smile. I am grateful and blessed to have known such a wonderful, kind hearted soul. Stan, I will be looking out for you down the hall until we meet again Sir. To The Martin Family, My Prayers go out to all of you. I have so many fun and fond memories of Stan. While boating with Stan and Maija, my late husband and I formed a friendship that I will always cherish! I am saddened at your loss. May the wonderful memories of Stan’s life and the comfort of our Lord’s loving arms sustain you. I wish I could be there to extend my sympathies in person to his family. Please know my thoughts and prayers are with you. I have many wonderful memories and am so thankful for his life! I too have may fond professional memories of Stan at NACS events. We dined together, shared stories and just enjoyed the times we were able to connect. My condolences to the immediate and extended Martin Family. Stan, you will be missed. Condolences to the Martin Family. May Stan’s memory be a blessing. I always enjoyed my relationship with Stan and will certainly miss him. We had some wonderful talks over the years and he was a fountain of business advice to me and our company. It was a pleasure to work with Stan at Quality Dairy. Always there with quick wit and a joke to make me smile. He will be truly missed by many. Martin family – many prayers for peace during this sad time. Stan was always kind to me and I enjoyed working for him. He took the Human Resources department out on his sailboat and we thoroughly enjoyed that. He had a sharp wit and was an astute negotiator when deciding upon salaries and who to hire for specific positions. He was always open to new ideas. He will be missed. My thoughts and prayers are with his family. Our sincere condolences go out to Maija and Stan’s family. Though we were harbor neighbors for only a few years, he is someone we will never forget. Stan’s smile, soft spoken manner, and his kind voice. He brought cider for us from his business in Lansing. We had so much fun sailing with Stan and Maija on our boat this past summer… so glad we did. This news is shocking and very sad… We will miss Stan. My husband Steven Mayhew and I send prayers and are deeply sorry for your loss. Maija, we are so sorry for your lost. So sorry to hear of Stan’s sudden and unexpected passing. Our condolences to Maija and the Martin family. Living just blocks away from the Martin’s when I was growing up I spent many days with the family getting to know the entire family. Stan being the oldest was the one we’d see coming home from work in his dairy boots and white outfit. Stan worked very hard at his craft and understood the meaning of hard work and working with others. Stan was genuinely interested in all kinds of topics and I especially remember his interest in computer science. We are all here on earth for a very short time and I believe Stan is now where he will be able to rest in peace. Stan was an icon in the community for sure. My condolences to the family. I had the pleasure of meeting Stan and doing business with him many years ago and have never forgotten his kindness. Once my boss, he was the kindest, man on this PLANET! Although I was just one of the thousands of people who’ve worked for Quality Dairy, I can honestly say, this man knew me by my REAL NAME! He was a Christian man who will be sitting with the guardian angels in Gods kingdom! It was an honor to work for him. Rest in heaven Stan! Maija you have my deepest sympathy. Stan was my great friend. We sailed together. We skied together. We worked on our businesses together through the CEO Network. Stan was a kind and thoughtful man and a respected leader and mentor to many. May God bless him and may he find peace in heaven’s rest. So sorry to hear of Stan’s death and I give my sincere condolences to his wife and family. We were college friends. He was indeed one of those kind and gentle people. Time goes too quickly. May the Lord give you comfort in your time of grief. I am truly saddened by the news of Stan’s passing. May the Lord wrap you all in his loving arms and the memories of Stan bring you peace at this time of great loss. I am thinking of you and wishing you peace to bring comfort and courage to face the days ahead. I send all of you my love and will continue to keep your family in my prayers. We are very sorry for your loss Our thoughts and prayers will be with you. I was so sorry to hear of Stan’s passing, the family has been in my thoughts and prayers. Stan and I had several conversations in my 31 years with the company from Michael Jackson to sailing. He will be missed. I am so sorry to hear about this awful loss. Stan was an amazing man and such a strong example of how to handle business! My thoughts and prayers to his family and QD as a whole! Stan is one of the best men I have ever known and I will ever be thankful for what he and the brothers did for my brother! So sorry to hear of your loss. God bless you and give you comfort. stan was known to all members of our family. john and myself and two of our children worked in some capacity.for Quality dairy. we rember him well and will miss him. You will be missed! Your smile was always a welcome sight and I enjoyed our conversations immensely. Paul & the Martin family. Sorry to hear of Stan’s passing. Prayers for you & your family. Maija – so sorry for your loss. I will always remember Stan for giving me my first job at QD on Trowbridge Rd. I have to admit, he always intimidated me a bit but I always found him friendly and easy to talk to. Again so sorry.